"Speaking In Guns" is the first project by Built In A Day. The game features levels set in the three types of '2D shooter' games: top, side and twin-stick. The project is based around the twin-stick control style, but applies this style to all level types. The single player section has top, side and twin-stick modes. Each mode includes three levels, plus mini-boss and final boss fights. There's also an 'Air Hockey' mode where you can square off against AI opponents. The multiplayer section includes a Coop mode where you can tackle the single-player levels with a second ship. 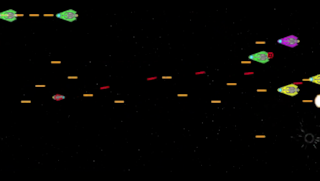 Co-Pilot mode features one ship, with players taking on Pilot/Gunner roles. Air Hockey let's you face-off 1-on-1 against a friend. The demo has a very light narrative element. The menu screens are presented like they are on a web browser and the mission select is intended to resemble shopping on a black market site. The player is meant to feel like a space pirate that is looking for jobs on a 'dark web' forum. Give the demo a try and send any feedback thru the Contact page. Whether it's good, bad or indifferent, your feedback will help determine if this concept is worth exploring. You can check out the Read Me page for info on game modes and control schemes. The Future Plans page explains the current design choices and presents some ideas for where the gameplay could go in future versions.